This week’s interview was conducted by Brian McDermott – thanks Brian! If you want to interview someone, send Ross Taylor and email at: ross@imagedeconstructed.com. Ilana, thanks for doing this. Can you explain the story you were photographing here and the background of arranging the shoot? This was an assignment from Buzzfeed. 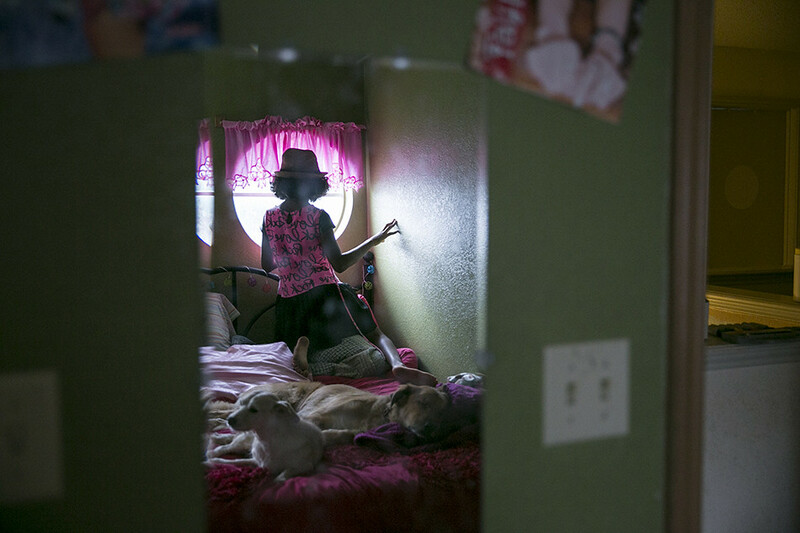 It’s a story about a young transgender girl living just north of Austin, Texas. 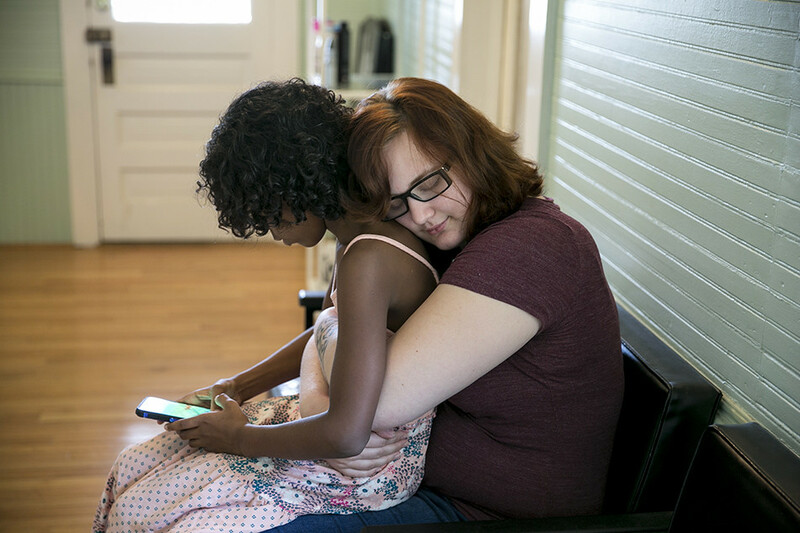 The bigger-picture story is about how parents and families deal with young transgender children (note: Nicole is the same alias used in the Buzzfeed article). Nicole is 11 as I photographed her, and was 9 when she socially transitioned to being a girl. What was particularly interesting about her story is that she grew up in a pretty conservative family, which also has a military background. I really loved meeting this family because the mom is so amazing in the way that she approached the situation. Nicole’s mother will say she went into this situation blind — she had no way to anticipate this development in one of her children. Going into the shoot my editor said to me, “we’re going to protect this girl’s privacy.” At first we weren’t sure whether Mom and Dad wanted their faces shown. They wanted to protect their young daughter. I knew from the beginning I wasn’t going to be able to show Nicole’s face, but I wasn’t sure about her parents or siblings. When I got there the family said I could shoot one sibling who was over 18, but the other sibling, who was under 18, could not be shown. The mother agreed to be photographed, but the father was unsure. So I went in trying to provide a variety of images of the family, though many images do not show faces of the subjects. This has become something of a specialty for me! Beyond this assignment, you’ve photographed at an immigration detention center for mothers and children, and you did a story on undocumented immigrants. So you’ve had the visual challenge repeatedly to tell a story without showing faces. Can you discuss how you approach taking good pictures with this kind of restriction? It is not easy because so much intimacy of a photograph comes from a person’s face. When you take that away, you’re left with trying to get creative around showing as much as possible, all without revealing that person’s identity. When I was in the immigrant detention facilities, I did a lot of silhouettes, mostly because there were big windows. I would be in a non-descript room with a window, and so what are my options? So I’ve done silhouettes in the past, many of which I liked, but it does get a little gimmicky. In terms of shooting a portrait, it’s hard. I’ll try and play with light and if I can somehow blow out the background and keep the people in the shadows, I’ll do that. I use hands a lot. I think hands are revealing because sometimes you can see a person’s body language in their hands. I’ll play. I’ll try different things. With Nicole, I wanted to try to do some of these portraits, but I also wanted to see what else I could do. I find that I move within a scene a lot more when I can’t show a face because I’m looking for things that are going to block that face. For example, when Nicole pulls out a cellphone, I instantly try to duck lower than she is so that the cellphone is blocking her face. It’s a different way of thinking about a subject. It’s just another challenge. Obviously as photojournalists we just take what we can get. We come into a situation and there are any number of challenges, and this is just one that I’m a little more practiced with at this point. Can you take us through this contact sheet? And I should mention that we blurred out Nicole’s face in the first picture of the contact sheet, the upper left frame, because it was recognizable. This was at a hair salon where Nicole, her sister, a family friend, and her mom were all going to get their hair done. I was waiting with them and I saw this moment happen where Nicole sat on her sister’s lap. I’m always looking for moments of interaction like this, particularly physical affection, and I thought it was a really sweet moment. I wasn’t sure how I was going to get it without showing Nicole’s face. You can see at the beginning I sort-of take a straight-on picture with her face. That’s probably me just figuring out what I’m going to do. And then I get closer, and I block out most of her face and just show her arms. I’m working it and cutting off parts of her face– that’s my effort to show a little bit of detail in face without showing identity. I tried for a side view I didn’t really like because both their faces are blocked, and then I moved lower but that wasn’t going to work because the cell phone is too low. So then I try for the feet, which is sort of a sweet image because Nicole ‘s feet are so feminine next to her older sister’s. So I’m still working my way around the two of them, and then I see that Nicole’s sister has made this very sweet kind of face and is hugging her and it seemed like the right moment– and I can show the sister’s face, so that worked. That’s where I ended up. There was another image that I really liked that I hadn’t necessarily seen. 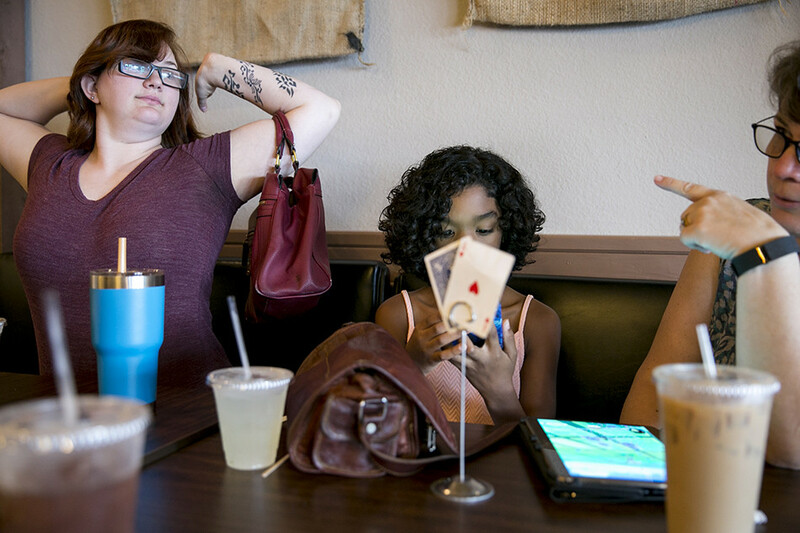 At a café, a pair of cards are blocking Nicole’s face. That’s something that my editor saw — I had put in the selection — but hadn’t really appreciated it. I like it because that was a split-second moment. That’s me being — I wouldn’t say desperate — but just looking for any little thing that’s going to block her identity. More generally how do you find subjects for your stories, and how do you get access to these personal moments successfully? In general the stories that I’m shooting for myself are stories that I particularly care about. I’m interested in women’s issues and I’m really interested in children’s issues. And immigration. And healthcare. I’m trying my best to be selective in terms of advertising myself to editors as in “this is the kind of work I want to produce for you.” When I’m thinking about my own stories that are self-funded and stories that I want to put my own time into, I’m pretty choosy. I like telling intimate stories, and I like being the only photographer. I really like slower, longer-term projects. I’m sure every photographer would say this! My goal is to shoot more of those projects both for myself and when on assignment. Those are the projects that really make me feel like I’m doing the work I set out to do. They way I get access is usually by asking directly for it, and being specific and saying what I want to photograph. People generally respond to straightforwardness and honesty. I also put time in. If you want to take intimate photos, you need to put the time in. You can’t just show up and have the intimacy be there in the photographs. So I try to really take my time with subjects as much as possible and get to know them, and attempt to figure out who they are. What advice would you give other photographers? I think the most important thing that somebody once told me was “make your personal projects the kind of work that you want to attract.” In other words, make the projects that you’re shooting for no money look like what you want to be shooting for money as much as possible. Editors are involved people and can see that. I think editors appreciate when they see your photographs or video is the personal, passionate, and committed work. They want to understand what drove you to make that body of work. And they’re going to hire you for that. 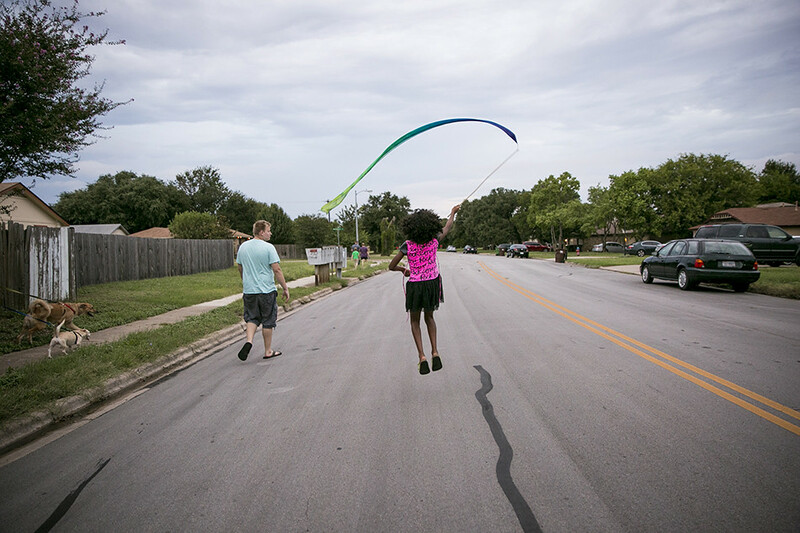 Ilana Panich-Linsman is a visual journalist based in Austin, Texas. In 2014, she was named one Magnum Photo's 30 under 30 . Her work has been recognized by the Lucie Foundation and been showcased on The New York Times LENS blog and on the CNN photography blog, among other awards and publications. 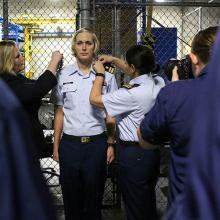 She participated in the VII Mentorship Program, assisting Stephanie Sinclair and Donna Ferrato. 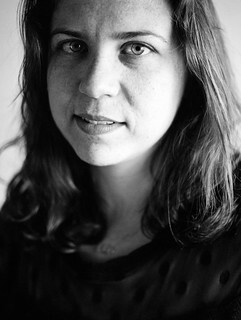 Ilana is a graduate of the International Center of Photography’s photojournalism program in New York City, where she was awarded a Director’s Fellowship, and graduated in 2014 from the University of the Arts, London, with a Master of Arts degree in photojournalism and documentary photography. Brian McDermott is a Senior Lecturer in the Journalism Department at the University of Massachusetts Amherst and a visual journalist. You can see his work here: http://brianmcdermott.net.